Well I guess it's time to go home. Here I am sitting at the bar at Il Vaggio Italian Kitchen outside of Delta gate D4 in the Salt Lake City Airport drinking a beer that is not 3.2 alcohol by volume finally and reflecting on the past 5 days of adventures in Salt Lake City, Provo and especially Moab. After landing in Salt Lake City a few of us headed to Provo to stay instead of driving the entire 4 hours to Moab. Provo is an interesting college town. It basically has 2 bars and they mostly sell 3.2 ABV beer. The laws in Utah are certainly interesting from the severe restrictions on ABV to the shot measuring devices to not being able to get a double shot but can get a drink with 2 separate shots. None of which makes much sense and is from a different time for sure. The three of us had some brews, talked about mountain biking, life and ate some below average food at a Japanese restaurant before heading back to the hotel. The next morning we got up early (not by choice as the 2 hour time change I never got used to) and headed to Moab. The first hour the terrain changed greatly. We started in mountains with lush green forests and soon thereafter we were in high desert and then it was like we were in a movie of the wild west with nothing but rock and sand for as far the eye could see. In the distance you could see an enormous snow covered La Sal mountain range peaking over the horizon in all its intimidating glory. As we got closer to Moab the terrain got seriously more rugged and I had the sense that many people perished in that harsh unrelenting environment over time and it is intimidating in that way. We got to Moab with some time to blow before our first ride and checked out all the bike shops. Moab's bike shops are well stocked with gear and bikes of many different brands. 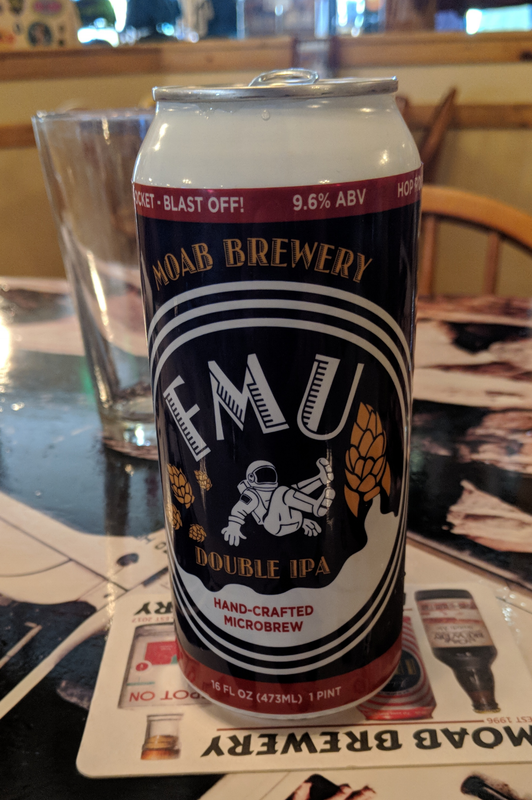 We grabbed lunch at the Moab brewery which even they cannot sell beer above 3.2 from the tap but they had a 9.6% 137 IBU double IPA in a can that was pretty good but super bitter. We finished lunch and headed to the Rim Condos that we were staying in to meet everyone and get setup in our rigs for the next 4 days. I got to ride a Spot Rollick 607 which is a sweet ride. It's a 650b, 160 mm travel, carbon bike that rides incredibly well. It has what they call the living link suspension that uses a leaf spring which eliminates some cartridge bearings and allows the bike to pedal up more efficiently. I was thoroughly impressed with the bike. Before, during and after setting up our bikes we all met each other and then off to the trail head for our first ride. We split into two groups and our guide Dave gets us together and we set out into the desert for our 16 mile ride. 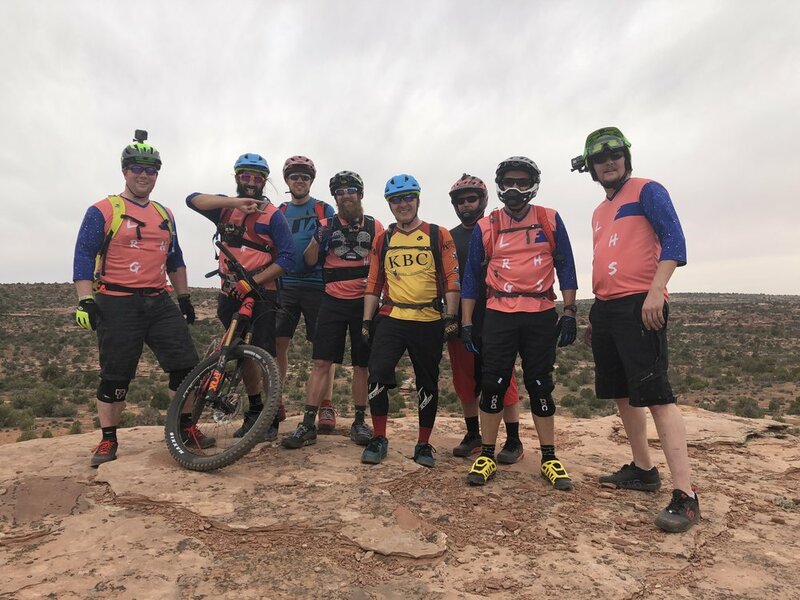 Having only been to Utah once before and long before I mountain biked I wasn't sure what to expect exactly but I knew it would be at the very least be a ton of fun. The trail starts out flowy and fast and every so often we would hit pockets of sand that attempted to bring you down and if you went off the trail at all the bike would become instantly unwieldy. This was an interesting part of Moab as the consequences of mistakes is higher due to the small stuff trees, cacti and loads of rock not to mention the fact that you are riding on cliffs much of the time. As we rode we eventually came upon slickrock. This stuff grips your tires incredibly well and you can gain speed in a hurry. This first day was mainly to get used to the terrain, our bikes and the elevation. We did that and had a great time. Soon after we finished we headed back to the condos, got our room assignments and showered. We had some time to talk to our roommates. One of the great part about s trip like this is that 12 people can come together with the love of the great outdoors and mountain biking and have a great time.